EVERGRIP Stainless wood fastener is designed to self-drill metal panels. Low Profile Pan Head with T-25 Torx Drive. Head and the majority of shank is 304 Stainless Steel, with a welded, hardened carbon steel point for self drilling performance. Provides the corrosion protection of stainless with the drill performance of a carbon steel fastener. Designed specifically for corrosion resistance in new wood treatments (ACQ/CA). 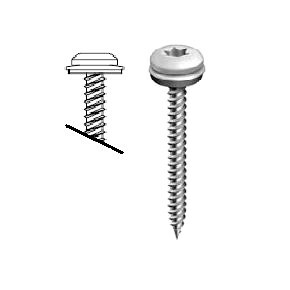 9 – 15 screw with Sharp Point. Self drills through the metal panels up to 24 GA and taps into wood substrate. Min penetration in wood substrates should be no less than 1"
Lengths: 1, 1-1/2, 2, 2-1/2, 3"
#8/10 x 1/2 in OD EPDM Bonded Sealing Washer. 20 Gauge Hot-Dip Galvanized Steel with Bonded EPDM Rubber Washer. [~.470 OD x .200 Inch ID metal washer with ~.150 ID rubber washer). Fits #8 to #10 screws. Price/100.